At the dawn of the twentieth century, major gold strikes were made in the Southern Nevada desert at Tonopah and Goldfield. The nearest railhead was at Sodaville, on the narrow gauge Carson & Colorado, recently acquired by the Southern Pacific. In 1904, the Tonopah Railroad was constructed to connect that town to the national rail network, and construction was started by the same promoters on the Goldfield Railroad from the end of the track at Tonopah. Initially the railroad was constructed as narrow gauge, but when the Southern Pacific announced the conversion of the Carson & Colorado to standard gauge in 1905, the Tonopah and Goldfield railroads also converted. In 1906, the two companies merged to form the Tonopah & Goldfield Railroad. T&G combination coach-baggage car was built in 1907 by the Pullman Car Company. While typical in many ways of cars constructed in that period, it had an open platform on the coach end instead of the closed vestibule which was more typical in 1907. This was likely done because combine No. 2 was intended for use at the tail end of a mixed train, rather than coupled to other passenger cars. Following typical practices of the period, the baggage end has no platform or vestibule. T&G combine No. 2 served the railroad until the line was abandoned in 1947. Taken off its trucks, the car body was moved to Wadsworth, Nevada, where it served variously as an antique store and for storage. 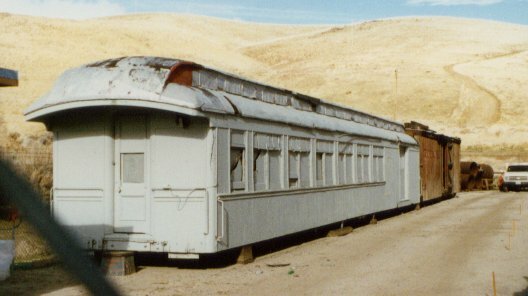 In early 1990s, owner Karl Kubler donated the car body to the Nevada State Railroad Museum for preservation. It awaits its turn for restoration as one of the few surviving cars from the once bustling rail lines around Tonopah.